"This is “THE WOW FACTOR”! The BOOM! Drum line is a high-energy, LED rock show compressed into 10 minutes. 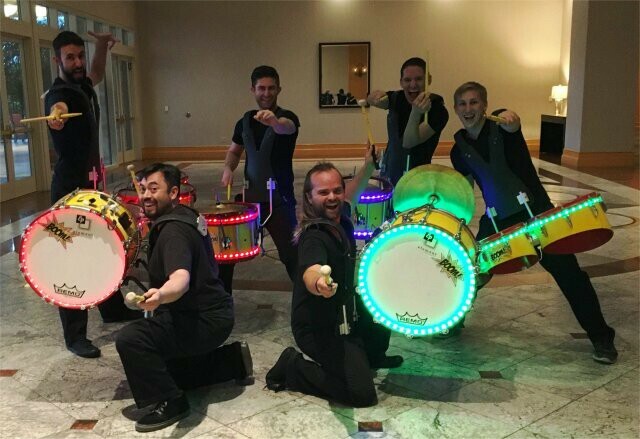 This group of interactive performers will electrify your audience to begin the day (or awaken them after a long day) and ignite their senses of vision, audio, and just plain fun with choreographed routines, stirring rock music, and virtuoso drumming! Want to wake them up or start them off with a smile? THIS is the answer! (Also a great option for “people-moving” in a most extraordinary way)!